A drive down Forest Lawn Road, on the line between Matthews and Weddington, is as peaceful as one might hope for on a drive in the country. Through the front black gates of Forest Lawn East Cemetery, visitors are greeted by a memorial to US Airways flight #5481 - a nine-foot-tall obelisk surrounded by 21 memorial markers - dedicated to those who lost their lives in the crash at Charlotte/Douglas International Airport, on January 9, 2003. Driving further along, you’ll find an old-fashioned water wheel and springhouse, a gazebo for flower- arranging near a botanical garden which overlooks the historical Sweetwater Spring, a small stone bridge overlooking the creek, and bird feeders, for attracting wildlife. There are azaleas, flowering dogwoods, sundials, a Lion’s Head fountain, professionally-landscaped flower gardens, marble seats, the Garden of Chimes, meandering roads and even-larger structures like the Sylvan Abbey Mausoleum – all designed to provide ample opportunities for reflection and meditation. This might well be the epitome of peacefulness and serenity. Upon closer look, you’ll also find upright and flat gravestones, silk flower arrangements and a variety of monuments, mausoleums, crypts and vaults in many sizes, shapes and colors and material. Currently 62 out of a prospective 65 acres have been developed and/or are being designated for future use. There are approximately 7000 units at the site. Forest Lawn East Cemetery is believed to be the only interdenominational cemetery in North Carolina. The beautification of the entire space is attributed to Williams; Reardon has continued that original mission. “Mr. Williams wanted it to be a park-like setting,” Reardon said. “He wanted people to be comfortable - where they could come here and visit; where it would be tranquil, and would be peaceful. They wouldn’t be walking away from here thinking they’d been in a ‘doom-and-gloom cemetery.’ ” she said. He also wanted to provide for anyone interested in being buried in his cemetery. To that aim, there is now a Jewish section, a Christian Orthodox (Greek and Russian Orthodox) section, and St. Matthews Catholic cemetery. There is also a Garden of Faith, Hope, Love, a Green Burial Preserve (no caskets or vaults), Baby Land children’s cemetery and St. Francis pet cemetery – offered outside of the cemetery proper. For those individuals wedded to their faith, they may choose to be buried in a faith-specific area; individuals may also choose to be buried in non denominational sections. In addition, the cemetery continues to be approached by faith-based groups seeking their own plot of land – their own piece of paradise. Once successfully negotiated, the cemetery “leaves it up to each faith to decide how they want to use their own space,” said Reardon. The first group to do so were members of the Jewish faith. In 1988, they approached the owner about finding an alternative to the only other Jewish cemetery in the area – the historic Hebrew Cemetery of Charlotte. After negotiating successfully to completion, their section now represents a decidedly Jewish perspective – only Jews can be buried there (an interfaith couple would need to be buried on opposite sides of the road), the caskets must be made of wood (not metal), and can be stained in one of three colors. The grave liner is made with holes in bottom so that each element returns the body to the earth. One simple black covering with a Star of David is allowed on top of the casket. Bodies are bathed and shrouded in a separate area in that location; add’l room has been created for prerequisite sitters, who spend up to a few hours guarding the body before the burial (preferably 24 hours). Approximately seven years ago, individuals from the Christian Orthodox churches approached the cemetery requesting their own section. Their ornate and often markers are often distinguished by large crosses at the top of gravestones. 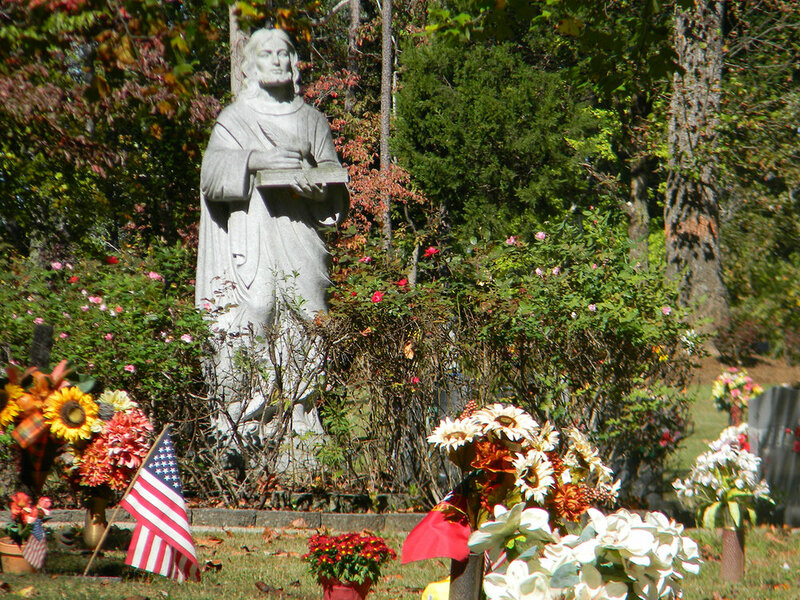 The Catholic cemetery does not require specific rituals, but offers a variety of options – small mausoleums, private estates with stacked stones, photos on gravestones, etc. Known as the “Garden of St. Matthew,” the Catholic section has columbarium units (buildings with niches in it) to house cremated remains as well as in-ground burials of cremated remains. Visitors can leave specialty silk flowers in the vases on or near the stones indefinitely or place fresh flower arrangements for up to 10 days after the memorial service. Recently, the cemetery has negotiated with members of the Baha’i faith for the creation of a new section. Required/requested rituals will be the adornment of ceremonial (hand) rings and shrouds made of 100% silk and cotton. Individuals will be bathed and placed in the highest caliber wood caskets off-site, before reaching the cemetery grounds. According to the Baha’i faith, burial must take place within 75 miles away from where death occurs. Currently, the Messianic congregation (Jewish and Gentile) - Hope of Israel Congregation in Charlotte - has been in talks to create its own section, too. As an independently owned funeral home (rather than as part of a corporation), Reardon says they have the “ability to offer all kinds of things to our families.” This includes balloon and dove releases, urns and caskets made of many different materials. A reception facility is located onsite for meeting and/or eating before or after the service. Everything can be taken care of in one place – from bathing the body and readying it for burial, to adding special touches to the memorial service, to hosting families for memorial dinners/get-togethers before or after services.